WinHMS Front Office streamlines one of the most crucial of all hospitality functions – the front office, where attitudes are shaped and lasting impressions are formed. Assuring fast, personalized service during check-in and check-out, it forges warm, sustainable guest relations. Online confirmations, instant handling of reservations, room tariffs, corporate discounts, foreign currency tariffs, quick assignment of rooms, guest amenities and lockers ensure efficiency that is well received by guests. Graphic-rich tape charts, room status display and room availability over any period, enable allocation and response to reservation queries and highlight projected room occupancy for the discerning manager. Guest check-in is completed swiftly while online tools including e-mail, notepad, calculator and calendar can be accessed without exiting the front screen. Bill management and check-out have ample and unique provisions for various requests such as bill routing, flexible bill splitting, provisional, summary and detailed bills, all of which is handled expediently and with precision. Check-in and check-out of large groups is done quickly and the module can manage consolidated billing, staggered arrivals and special tariff plans with ease. Group history and contribution facilitates block selling and special package plans. The night audit function highlights all FO/POS pending bills, KOT dues and any non-posting of room charges. Revenue collections are tallied and transferred automatically from the Front Office module to the Integrated Accounts module. A powerful guest search option helps track pertinent guest information, spend patterns and preferences. E-mails can be generated on guest birthdays and anniversaries, enhancing the hotel’s reputation for personalized guest relations. In addition, member databases for loyalty programs, health facilities and the like can be maintained while various discount structures are supported. WinHMS POS supports KOT creation and modification, cover routing, billing and settlement, allowing for the provision of audit trails. Guest preferences and dislikes can be displayed on the KOT screen ensuring outstanding guest service. Speedy execution at the kitchens is facilitated by grouping and printing items ordered kitchen-wise. Provisions are built in for happy hour discounts for selected items at selected outlets. Billing is completed in seconds and outlet-wise items, rates and applicable discounts are grouped together effectively. Bills can also be posted in multiple currencies and transferred to the Front Office for settlement. WinHMS Housekeeping helps set the house in order by tracking guest requests, suggestions and complaints and ensuring that these are attended to timeously. Checked out rooms are automatically tagged as ‘dirty’ and blocked for maintenance. Room Items Inventory is optimized and missing items are tagged. Tracks all items ‘loaned’ to guests and others. WinHMS Call Monitoring ensures efficient call monitoring. It logs calls made from rooms and other extensions and makes available a detailed print out of the telephone account of any guest in real time. Guest services such as wake-up calls and enquiries are executed efficiently apart from providing reports on call queries, list of all calls, special calls and unbilled calls. WinHMS Accounts Receivable is a full-function receivables system that allows the user to effectively track customer accounts for prompt collection. 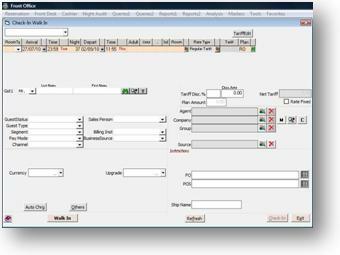 It supports custom age analysis, statements of account, reminder letters, receipt due reports and receivable cash flows.